This story exposed how Barclays bank’s customers’ personal details were being sold on a black market so that they could then be targeted by unscrupulous traders for investments. 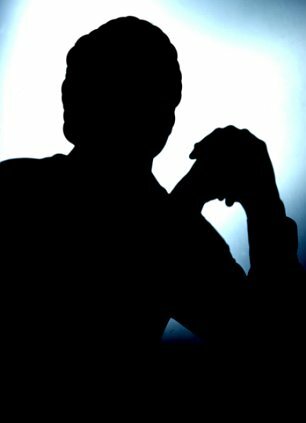 A whistleblower within the banking industry contacted us as he felt there was a huge cover-up that needed to be exposed. We contacted the Mail on Sunday newspaper and helped run an investigation which resulted in a front page story. The story was followed up by the majority of newspapers and TV news channels. Barclays Bank is reeling from an unprecedented security breach after thousands of confidential customer files were stolen and sold on to rogue City traders. In the worst case of data loss from a British High Street bank, highly sensitive information, including customers’ earnings, savings, mortgages, health issues and insurance policies, ended up in the hands of unscrupulous brokers. The data ‘gold mine’ – also containing passport and national insurance numbers – is worth millions on the black market because it allowed unsuspecting individuals to be targeted in investment scams. Barclays last night launched an urgent investigation and promised to co-operate with police. It is not clear how the records were stolen, but the bank could face an unlimited fine if found guilty of putting customers’ details at risk. He claimed it was a sample from a stolen database of up to 27,000 files, which he said could be sold by shady salesmen for up to £50 per file. Under the guidance of lawyers, this newspaper has viewed a small selection of the files, which are effectively stolen goods. Each report is about 20 pages long, and among the victims are doctors, businessmen, scientists, a musician and a cleaner. Barclays, which was fined £290 million in 2012 for its part in the Libor rigging scandal, said it would contact the customers as soon as possible. The loss is a breach of its obligation under the Data Protection Act to keep personal information secure. All the customers had sought financial advice from the bank, and passed on their details during meetings with an adviser. The consultations included filling out questionnaires – or ‘psychometric tests’ – which revealed their attitude to risk. That information could be exploited to persuade victims to buy into questionable investments. ‘The data is a gold mine for traders because it is so incredibly detailed. It gets them inside the customer’s head,’ said the whistleblower, who is prepared to make a statement to police. Until last year he was working alongside a firm of brokers which, he said, regularly tried to get people to invest in ‘all manner of dodgy schemes’. He said select traders were given the ‘Barclays leads’ which they exploited to the full. ‘They would start by saying that they had a great investment opportunity that would suit someone on a particular income or with a particular amount of money to invest. The whistleblower showed the leads to a select group of brokers ‘who thought they were amazing’, but eventually decided not to sell. Between December 2012 and September 2013 the firm persuaded victims to buy rare earth metals that did not exist, it is claimed. The whistleblower estimates up to 1,000 people could have been ‘scammed’. When the investors began to suspect they were being fleeced he said the boss chose to ‘shut the trading floor’. ‘His orders were to get rid of the evidence, to show that we were never there. We bleached the desks so his DNA was not in the office. We destroyed his laptop and 15 bags of paperwork. We wiped the computers. During this fiasco he asked me, “Have you got the Barclays leads?” I said, “No, I haven’t, they must have been destroyed”. Barclays said in a statement: ‘We are grateful to The Mail on Sunday for bringing this to our attention and we contacted the Information Commissioner and other regulators on Friday as soon as we were made aware. ‘Our initial investigations suggest this is isolated to customers linked to our Barclays Financial Planning business, which we ceased in 2011. ‘We will take all necessary steps to contact and advise those customers as soon as possible so that they can also ensure the safety of their personal data. ‘Protecting customers’ data is a top priority and we take this issue extremely seriously. This appears to be criminal action and we will co-operate with the authorities on pursuing the perpetrator. It is not the first data loss by a leading bank, but the depth of the data included in this case outstrips anything else uncovered so far. The Information Commissioner’s Office can impose fines of up to £500,000 on organisations that fail to protect private data. But the City watchdog the Financial Conduct Authority can levy unlimited fines. In 2009 HSBC was fined £3million after parts of its business were found to have been ‘careless’ in handing customers’ data when discs were lost in the post; and in 2010 the UK arm of Zurich Insurance was fined £2.275 million after it lost 46,000 customers’ data. In neither case was the data thought to have fallen into the wrong hands. 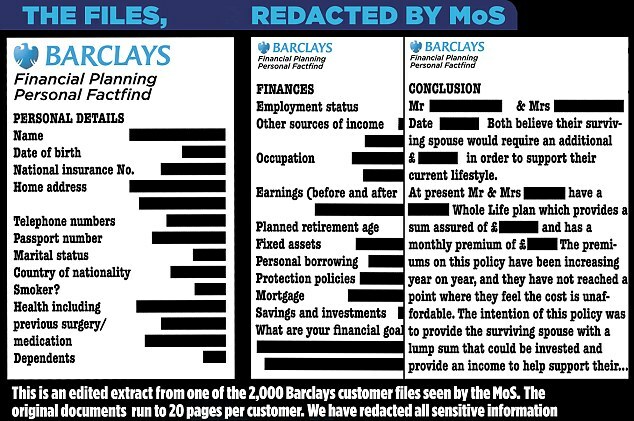 But the Barclays data appears to have been actively stolen and ended up in the hands of unscrupulous salesmen. The revelation comes as the bank is bracing itself for a row over bonuses, with as much as £2.4 billion set to be handed out to staff. 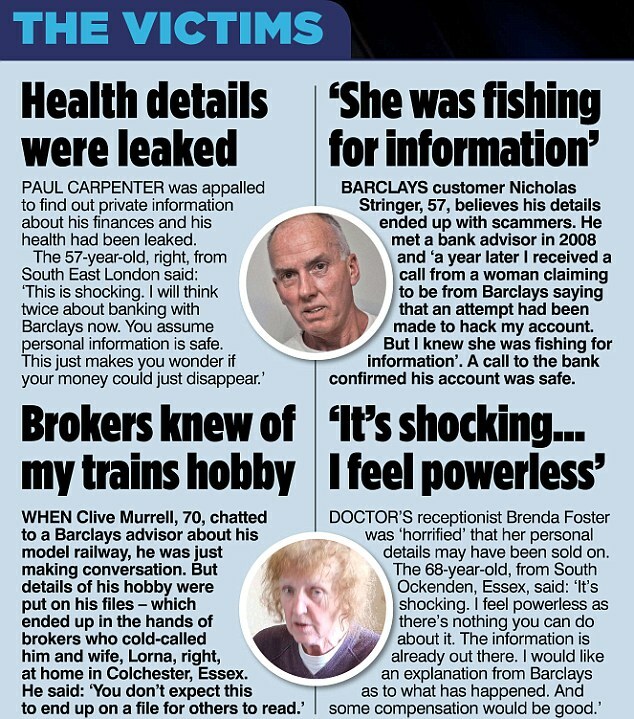 I was given the Barclays ‘leads’ after they had been ‘rinsed’ – or used up – and told to sell them to other brokers. In the end, I didn’t do this because I thought it was wrong – and by that time I’d had enough of the whole business. There is no question that the Barclays data was used, though. It was pure gold to brokers (who must have made a fortune out of it) because it gave them a psychological edge over potential investors – their victims. Because of its detail it allowed the brokers to get inside the minds of their targets. They knew exactly how much money these people were prepared to invest and their attitude to risk. They knew everything about them and tailored their strategy accordingly. I was told only the best brokers were given the Barclays leads – these are the most manipulative people. There are a lot of good people in the brokerage industry but also a lot of undesirables. I know plenty of drug dealers who got involved because they realised they could make more money in the City than they could on the streets. The perfect money-making opportunity for many of the brokers came during the recession when people’s savings were hit by low interest rates. Potential investors became susceptible to the broker’s questionable approaches and promises of sky-high returns. I worked at a type of brokerage known in the industry as a ‘spank shop’, operating from rented offices outside London or even in the City. The brokers ‘spank’ or punish people over the phone by advising them to invest in certain commodities which make lots of money for the broker, but not the investor. The broker sells the commodity for such a massive mark up that it eliminates any opportunity the investor has to make money. The industry gets young people, brainwashes them, shows them a high end lifestyle and trains them to pull private investors. Brokerages want to hire people who are money-oriented, articulate and who speak the Queen’s English. Their ideal is the young, hungry white guy. They want the most aggressive person, very manipulative and bullish, almost like a New York broker in the 1980s. They might even ask the interviewee to sing a song. They want to see if they can bend them over a barrel and get them to do what they want. Out of 10,000 brokers, 9,000 will be earning below the minimum wage. The majority will never succeed. The successful ones do not have a moral compass. Most people drop out after a couple of years because they burn out but I know old school brokers who’ve done it since the 1980s. We got trained by Jordan Belfort, the real-life Wolf of Wall Street. It cost £38,000 for an hour’s conference call with him from New York. Three different firms took part and there were 40 brokers in the room, sitting around a phone. He’s big on ‘rapport building’. He shows how to apply pressure in the right places – how to manipulate people in a controlled way. In all cases, brokers try to find the person’s motive for investing. When trust is established it’s very easy to make the ale or ‘load’ a client with a commodity. Loaders are a breed of broker and some can earn 40 per cent a deal on just the commission. At one time carbon credits were the top commodities sold. Investors paid £6.50 for the credits – in fact worth nothing. Now the spank shops are selling diamonds and rare earth metals. Brokers can quickly get greedy. A quantity of diamonds sold to a broker for £1,000 are sold on to the investor (or victim) for £40,000. A lot of contracts between broker and investor include ‘exit confirmation’ – the date when the return on investment is expected. But in many cases those clauses are a lie. A month or two before the exit strategy is due, the firm winds up and disappears. The owners – criminals in sharp suits – will set up shop, trade for a bit, then the company will close, only for the brokers to open another one. The next day they ring the same clients, but with different voices on the end of the phone. You might use a different name – nobody uses their real name. Many on the Barclays list were born in the 1930s. Old people are perfect targets because they are more trusting and they haven’t got long left. You hope they die before your exit strategy comes up. The spank shop industry is terrible and needs to be stamped out.